A cornerstone of life at St. John’s is our commitment to Christian values and the development of moral character. We are devoted to our Episcopal identity and to our role as an outreach of St. John’s Episcopal Church. Affirming our religious heritage, we reach out to people of all faiths and backgrounds by accentuating the common elements of our personal, spiritual and communal growth. The school prayer is used at assemblies, chapel, faculty meetings, and other special occasions. Students and faculty hold hands as a symbol of togetherness when they share the school prayer. People: Help us to learn from you. People: Make us kind to one another. People: Keep us honest in all we do. People: Help us to see your face in theirs. People: Make your compassion and hope our own. 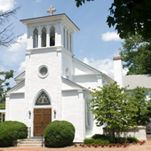 For more information, please visit our church website at https://stjec.org/ or The Episcopal Diocese of Washington at https://www.edow.org.